into service of the crown, and blocking the trade with everyone else, Philly was piping up. Wooden you? the bigger the bore the harder it was to make, but a 4.5” has double, and a 6” quadruple, the volume of the 3” bore. The ends of the bored logs were hooked together into pipelines with iron couplings and straps. Bounded by two rivers and with water from smaller streams to the north within reach of the city via aqueduct, Philadelphia had numerous choices for the source of its water supply. The Delaware River was deemed unsatisfactory as it was a major port, with all the pollution associated with such activity, as well as the action of the tide and the proximity of marshland. For many years it seemed that the City would accept a proposal from proprietors of the Delaware and Schuylkill Canal to supply water. The canal was never completed, and after much wrangling this proposal also was turned down. The city leaders decided to make providing water a municipal responsibility, with a city-owned water works rather than a system built by a private company which would then lease it back to the city. * The water source finally chosen, the Schuylkill River, was fast-flowing, removed from the City’s population center, and had an extensive upstream watershed that ensured a steady supply. I love the name chosen for the group in charge of making it happen, The Philadelphia Watering Committee. The Schuylkill or Lower Engine House located at the foot of Chestnut Street, drew water from the Schuylkill River. 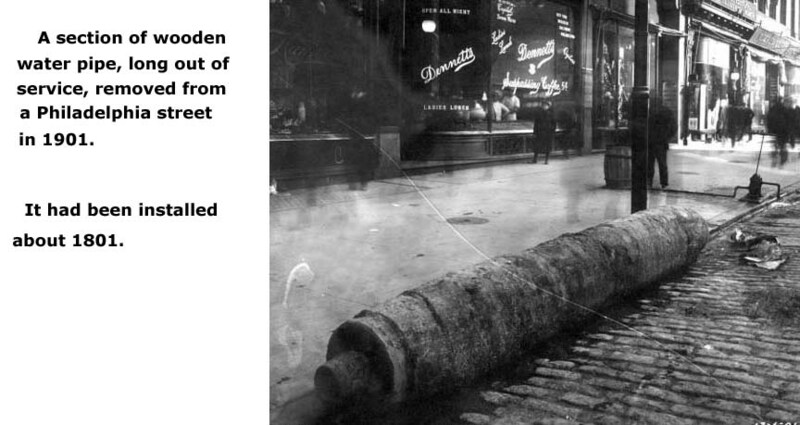 This engine pumped water into a brick conduit that ran under Chestnut Street to a second pumping station in Centre Square, at the intersection of Broad and Market streets, where City Hall stands today. There a second engine pumped the water into wooden reservoirs at the top of the building, from which it flowed into a distribution system of wooden pipes into the city. The wooden plumbing supplied timber-tasting water to residents who could either fill their buckets for free at a public standpipe or pay $5 a year to connect directly to faucets in their yards or kitchens. There was an insect in the greasy stuff though. At the time there were only three large steam engines in the entire country, two imported from England and the third a copy made here. They hired the man who made the copy, Teddy Roosevelt’s great great grandfather, to build not more copies but two of unique design. They worked but broke down often and cost a fortune in wood and coal to feed. One major defect with Latrobe’s system was that if either engine broke down—the one at the Schuylkill that lifted water into the conduit to Centre Square, or the one at Centre Square, which lifted it into the reservoirs—the whole system went off-line. The reservoir tanks of the system were small, holding just 17,660 gallons. This supply would run out in about twenty-five minutes if no additional water was pumped in, which put the fire-fighting capacity of the city at risk when the system was not working. 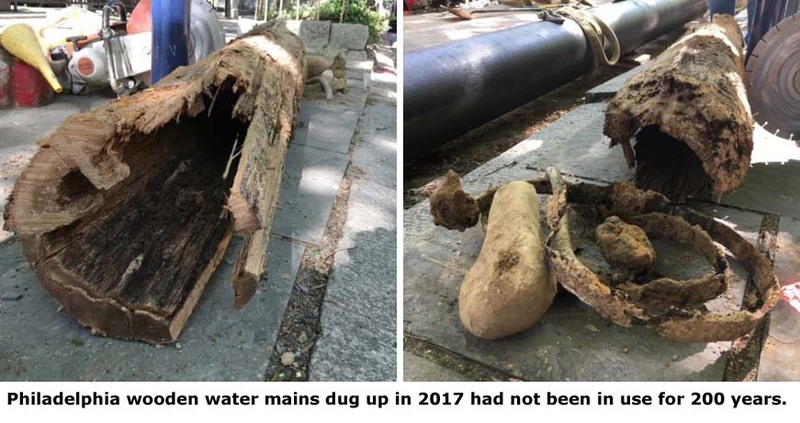 Last year our town dug up some ancient redwood water pipes too. I should think that Redwood would last a long time in the ground.